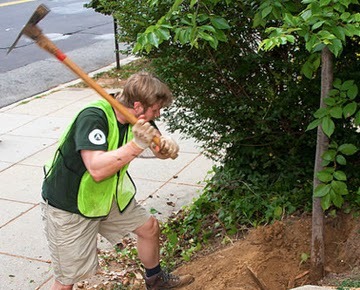 At top, our volunteer Treekeepers help two linden trees by a busy bus stop, where people need cool and shade. Below, Treekeepers remove rocks and clay hindering young elms by the Embassies of Georgia and Turkmenistan. Above Mikel and Joe Witte dug away dirt, glass, and junk packed around one stressed linden. Michael Kinzer swept this discarded stuff into a tarp so we could carry it to the public trash. 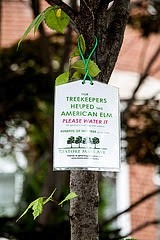 Embassy Row Hotel (2015 Mass) connected its spigot to our hose, so we gave these thirsty trees lots of water. Shown are the hotel's Derek Strickland Jr. and Max Noyes with Treekeepers. 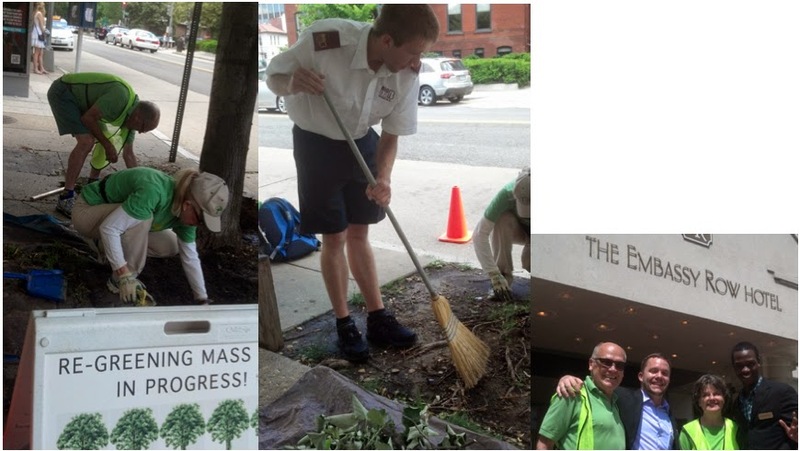 The trees we helped in another session were two little elms which RMA and Casey Trees had planted to rebuild the historic second row in the 2200 block of Mass. Their roots were suffocating from clay and rocks that had piled up in the sloping yards. At left is the hole we dug to excavate the base of the little elm by the Embassy of Turkmenistan (2207 Mass). 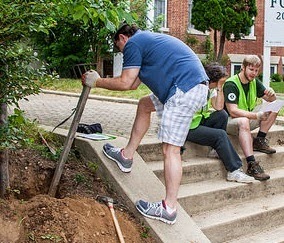 Below, Treekeeper Matt Milano pulls out the stake around the next-door elm at the Embassy of Georgia (2209 Mass). Garrett Steed needed a pickaxe to excavate the hard clay around this tree. Later Rob Nevitt mulched both trees. We gave them several doses of water. Both embassies will follow up. Now that these trees' roots can get water and air directly, they should grow better. We tag one elm to show its benefits. As a 2.5" American elm it provides $8 in annual benefits. IF we can grow it to 8" in diameter the tree will give back $52 per year, according to treebenefits.com. But whether young city trees ever reach their mature size is a big IF. They need help! To get notices of August and September volunteer sessions, please email volunteer@restoremassave.org. We hope to greet you under the trees!